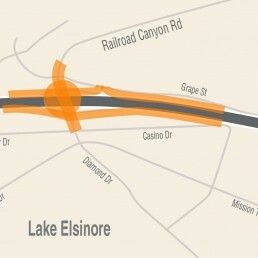 The Riverside County Transportation Commission (RCTC), in partnership with Caltrans and the City of Lake Elsinore, is completing the final design phase to prepare for construction of the Interstate 15 Railroad Canyon Interchange in Lake Elsinore. At the request of the City of Lake Elsinore, RCTC has been the lead implementing agency for the project since 2013. • Construction of improved pedestrian and bicycle facilities through the interchange. The California Transportation Commission approved $15 million in Gas Tax funding in May 2018. This represents the remaining funding needed to build this $45 million project. Funding is comprised of a combination of sources, including City, State, Gas Tax, Federal and Transportation Uniform Mitigation Fees. RCTC is in the process of completing final design for the project and is acquiring property right of way. Following the completion of final design in 2019, RCTC expects to advertise for construction bids in late 2019 and award a construction contract in early 2020. Work is expected to begin in 2020 and take about 2.5 years to complete. The project is proposed to be built in four stages. However, this staging may change, depending upon methods recommended by the selected contractor. 2000: City of Lake Elsinore and Caltrans conducted a Project Study Report. Five alternatives and a no-build alternative were approved in the PSR in 2003. 2006: A Value Analysis Study was performed to evaluate each alternative. 2008: A Traffic Impact Analysis Study was completed, which identified four traffic scenarios. An Alternative Reduction Workshop was held and three alternatives were advanced for further study. The Federal Highway Administration (FHWA) provided suggestions to improve two alternatives, and in 2009, the City of Lake Elsinore and Caltrans eliminated the third remaining alternative. 2013: City of Lake Elsinore requested that RCTC manage the Project on its behalf. 2017: Caltrans released the Draft Environmental Document (DED). After comments were received, Caltrans selected Alternative 2, which consists of construction of the interchange with hook ramps at Grape Street. The Federal Highway Administration approved the project’s Finding of No Significant Impact. May 2018: RCTC receives balance of project funding through California Transportation Commission allocation of $15 million in Gas Tax revenue; project is fully funded. Summer 2020: Construction expected to start. Depending upon the status of right of way acquisition, the start of construction could be delayed until late 2020.